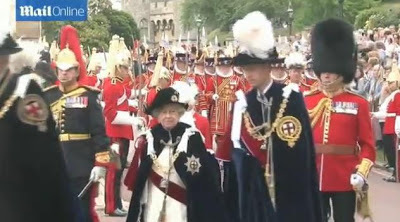 The Queen gave a Luncheon Party for the Companions of the Most Noble Order of the Garter. A Service was held in St. George's Chapel this afternoon. Click above for an article, pictures and video from the Daily Mail. Well, Her Maj ignored my request for sapphires, but she's compensated by giving us another look at a little pair of earrings we've seen once before on the blog, these diamond pendant jobs. I'll take it. I didn't really see a bracelet or watch, though - possibly under the gloves, not that extra jewels are ever easy to pick out from under the robe.